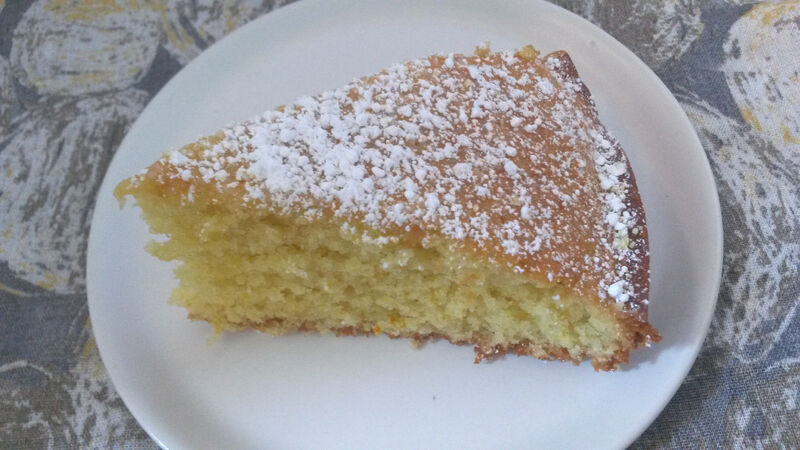 If I’d used that olive oil in this cake, I imagine it would have had an even more interesting flavor profile. Instead, by going with an everyday olive oil, the citrus got to shine instead. I increased the amount of zest because recipes never call for enough zest (when will they learn? ), and though orange juice and orange zest were present, it’s mostly the lemon flavor that comes through. The cake’s texture is fantastic as well. I didn’t expect it to rise as much as it did in the cookbook picture–a normal rise at the edges and then a tall, impossible dome in the center–but it did. 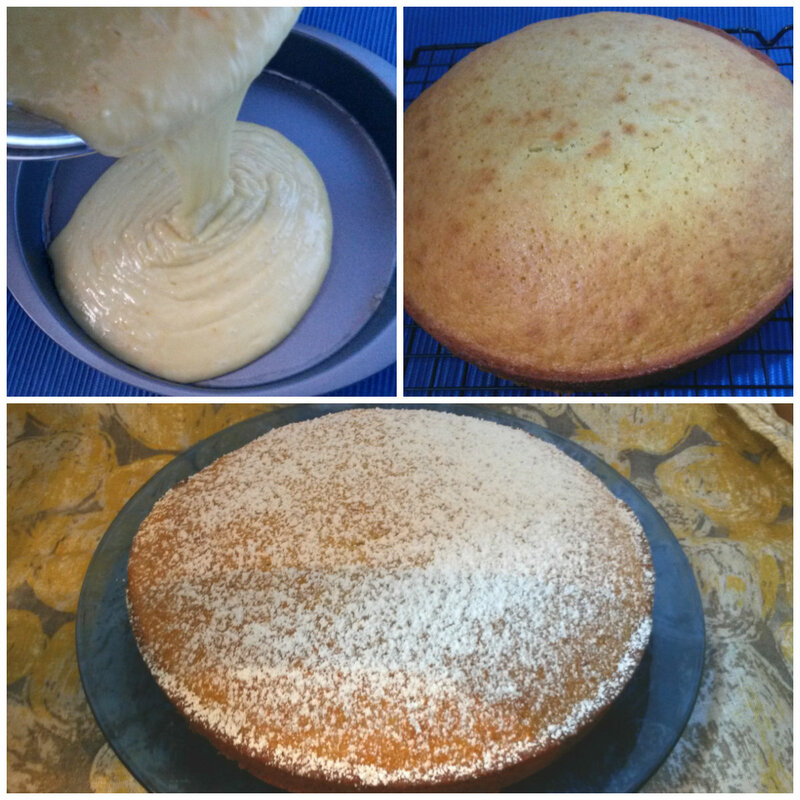 The result is a soft, fluffy cake with a delicate crumb–perhaps owing to the use of superfine sugar. This is a classy cake. A cake that transcends frosting, that needs just a light dusting of powdered sugar to be ready for society. Light, airy, and perfect for summer. Though I love having ice cream with cake, I felt that putting a scoop of vanilla next to this cake would insult it somehow. Instead, I carried on with the summery theme and paired it with bing cherries. Not that I let the cherries get close enough to the cake to stain it, of course. This is a classy cake, after all. 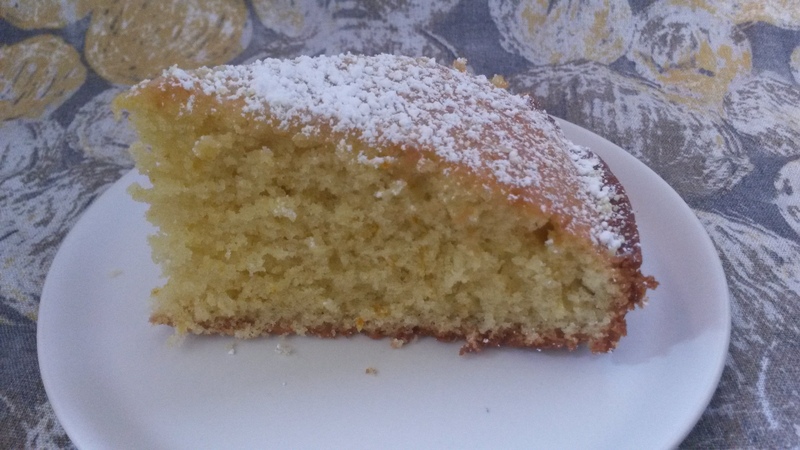 This recipe came from The Baking Bible, which I adore for its focus on Australian recipes. After a childhood of reading my mother’s Australian Women’s Weekly cookbooks and baking whatever looked good, Australian recipes are always a comfort to me. 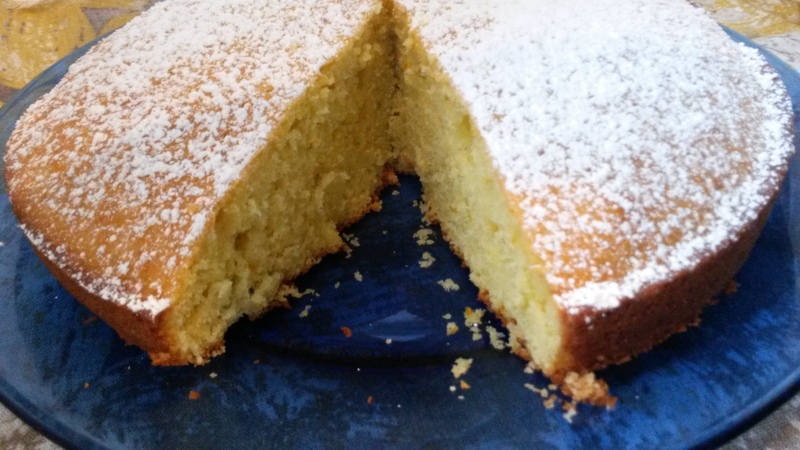 My modifications include increasing the amounts of zest and substituting flour and baking powder for the self-raising flour listed in the original recipe. Preheat the oven to 350 degrees and lightly grease an 8-inch round cake pan. Whisk together the eggs and sugar. Add the zest and stir in the oil. In a separate bowl, mix together the flour, baking powder, and salt. Add half of the flour mixture to the batter, and then half of the milk and orange juice. Stir to combine and then add the remainder of the flour mixture and the milk and orange juice. Stir again and pour into the greased cake pan. Bake for 25-30 minutes, or 40 minutes if needed (the original recipe said 40 minutes, but when I checked it at 29 minutes it was ready, and my oven is usually slow about these things). It will be ready when the edges are brown and a toothpick inserted in the middle comes out clean. *I just ran the sugar through a blender for a few seconds–not long enough to turn it into powdered sugar, but just enough to break down the granules a bit. It shouldn’t be a problem to use regular sugar, though.